I wrote an editorial asking about things that needed to be done to improve replication. There are plenty of things that need help, but as I was testing some replication, I got this the other day. I am trying to setup a secure home network (other than the same password for a few services to make life easier). I have firewalls running and open specific ports for SQL Server. In this case, I have multiple instances on this machine, so I opened a port for a named instance. 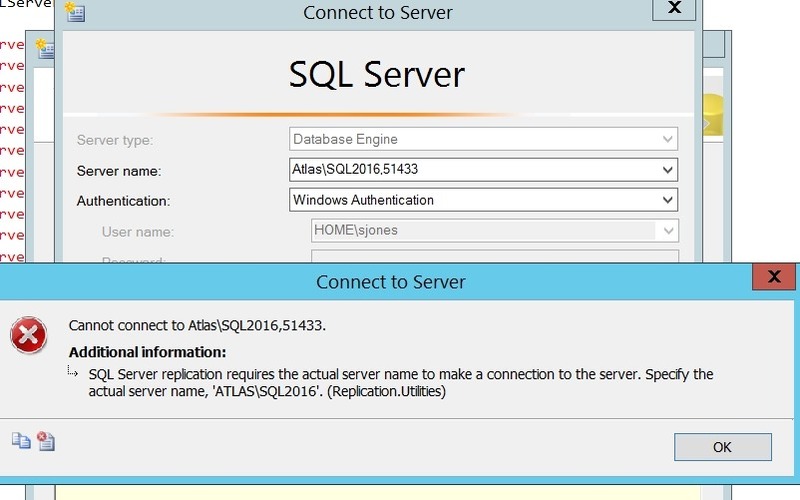 I didn’t want the SQL Browser running, and connected with the port. Guess which ones work? Only the name/instance. Perhaps I’m doing something wrong, or there’s a setting, but this is a bit silly that valid connection strings with ports don’t seem to work with replication. This entry was posted in Blog and tagged replication, security. Bookmark the permalink.